First of all, characterizing Prey as a novel is deceptive. It is clearly nothing more than the early storyboard work for a truly awful summer blockbuster. The plot is slow, predictable, and overburdened with alarmist tangents. The characters and dialog are inane and infuriatingly stupid. I found myself rooting for the evil faceless cloud, at least until the evil cloud got a face of its own and became just as insipid as the rest of the characters. The science, of which there is a heavy dose delivered without apparent critical thinking, is implausible on every level. I remember enjoying Sphere and Jurassic Park several years ago, and I don't really know how Prey turned out this way. 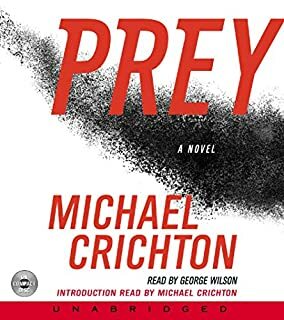 All I can think is that Prey must have been ghostwritten, churned out not by Crichton but by a fog of swarming nanomachines, able to type but having no knowledge of how actual people think, communicate, or behave.